Abu Dhabi, 18 March, 2013 – For the year ended 31 December 2012 Finance House PJSC (FH) has recorded a net profit of AED 72.2 million, up 20.4% from AED 60 million achieved in the previous year. Total assets grew six per cent (6%) to reach AED 3.72 billion as at 31 December 2012, compared to AED 3.51 billion registered at 31 December 2011. Customer deposits grew by a robust 16.5% to reach AED 1.80 billion as at 31 December 2012 compared to AED 1.55 billion as at 31 December 2011, results that demonstrate the continued credibility, reputation and trust enjoyed by Finance House in the market. 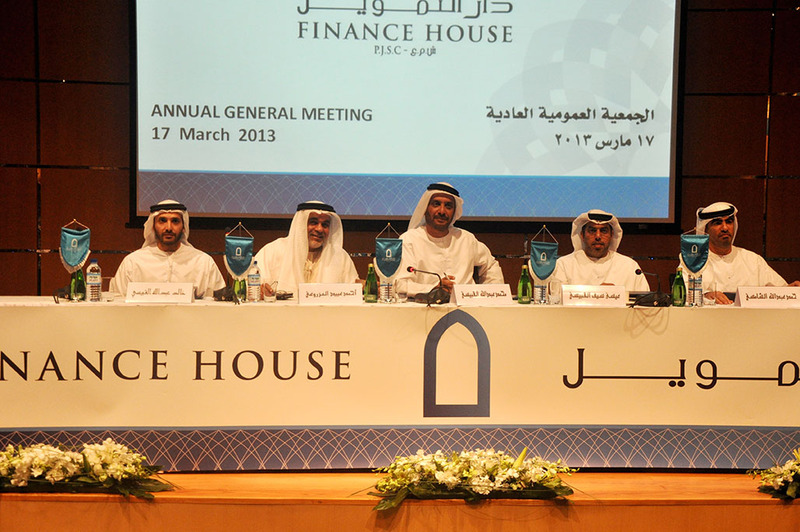 Considering the robust financial performance of the company for the year ended 31 December 2012, the Shareholders of Finance House approved the payment of a cash dividend of 12%, during the Annual General Meeting held at the Emirates Institute for Banking and Financial Studies (EIBFS) in Abu Dhabi. In his address to shareholders, Mohammed Alqubaisi, Chairman of Finance House, said: “We have moved another step forward in the path to success as we celebrate eight years of conquering diverse challenges and overcoming tough market conditions”. We march towards 2013 with confidence, he said, adding: “Finance House is again looking to scale new heights of success in 2013 as the company has been adjudged Best Business Finance Company in the Middle East, and has retained the Best Retail Finance Company in the Middle East award for the second consecutive year at the Banker Middle East Industry Awards 2012”. The Chairman said: “Political and economic instability continued to haunt the MENA region in 2012, shaking investor confidence and dampening business sentiments. We hope that the situation will change for the better during the present year, restoring the faith of investors completely and bringing robust growth in all sectors”. “The UAE, which remains our key focus market, has been the oasis of relative stability on the political and economic fronts even during the turbulent period, and this stability in the economy can be attributed to its prudent leadership”, he added. “As a responsible national organization, we are keeping a close watch on all unfolding situations in the MENA region, but at present our business strategies or near-term growth objectives will remain the same as we are confident of its efficacy in the midst of ongoing changes in the regional and global landscape”, the Chairman added. Alqubaisi said: “Our strong capital base, clear business strategies, well diversified asset book, combined with our capability to exploit various opportunities to our advantage, will take us to new heights of achievement in 2013”. “We have entered 2013 with renewed dynamism as we have added new features to our existing Smart Guarantee product (SG), which will now cover the entire AED 28 charge on behalf of establishments operating in the UAE, and will also pay them interest on their guarantee margins deposited with us", he added. “We will continue to innovate and improve our products and services this year to match the growing expectations of our customers, driven by our passion for excellence and our deep understanding of our customers’ needs”, the Chairman concluded.